It took nine months of gestation, but I now feel I understand this telescope well enough to write a worthwhile review. Nice write up Joe. Funny thing is I've done some "side by side" comparison's with my 8" EdgeHD and Meade 152ED and arrived at the same conclusions as you did (with your AP 155) I'm a tad more lazy however and use only one Mount! I'm still deciding If the brightness of the SCT or sharpness of the ED Doublet will win out? (kinda like that old "taste great, less filling" saying. For now I have both and may just keep both as each offers something the other doesn't. Also, I might add my 8" EdgeHD has the TEMP-est fans and they work! Last night I ran than for about 20min and no heat plume were present, something that never happens in my location with SCT's after running the Cat Cooler for 30 - 40 min. If you don't have the fans, I strongly recommend them. Edited by junomike, 05 June 2015 - 04:02 PM. Very nice review Joe. Thanks for posting it. I haven't had a big cooldown problem with the scope so far because of the way I store it. If I had a bigger one I would definitely get the fans. Nice write up Joe. It was fun to read. 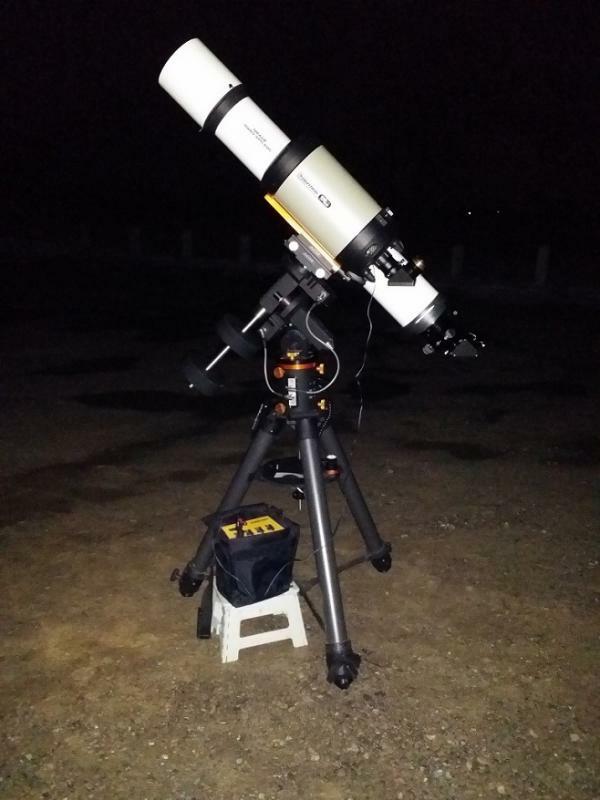 I noticed on the part of your story when you compared the 7" apo refractor to your c8 edge you mentioned there was a binoviewer on the apo. 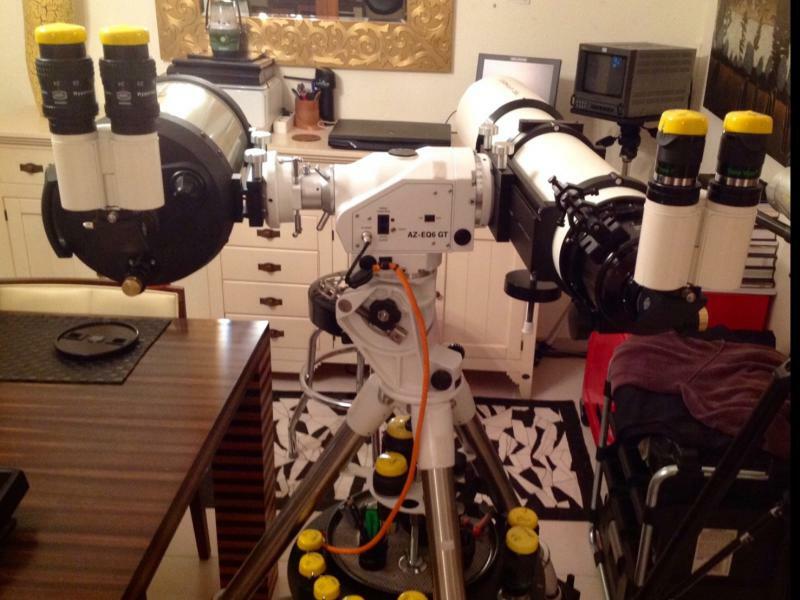 I recently bought an edge scope and was very impressed with the clarity and brightness through eyepieces. A few weeks later I bought a binoviewer for it and a couple of middle of the road 66 degree, 20mm eyepieces from Orion. The difference was very noticeable. It was not subtle at all. The moon and Jupiter both looked larger and more detailed with better contrast and depth. Even areas of the moon far away from the terminator looked pretty contrasty. I believe the binoviewer made a bigger difference than than the scope alone made. I am sure that 7" apo was amazing but with brighter objects the binoviewer can really change the way we see things through our scopes. By the way, congratulations on your new scope. It should serve you well. Do you have a name for it like Uncle Rod has for his? I realize that the binoviewer was a considerable advantage to the 7" refractor. But, there's no way a binoviewer could have come close to making up the deficit in the SCT. The difference between them was pretty startling. I'm sure I will stick my binoviewer in the C-8 sooner or later to see how it does. I haven't yet settled on a name for the SCT. I toyed with "The Edge of Night", but I'm not sure that will stick. Edited by Joe Bergeron, 05 June 2015 - 06:18 PM. Nice review Joe! I am a fan of your reviews/articles. As for the result of the testing--I would have expected the same. The one factor that would really help even the scales a bit would be to get cooling out of the equation and like junomike said, the TEMPest fans work and are really a must-have. Yeah, I am really hoping an unknown but wealthy relative will leave me a 7" apo refractor. Not much can keep up with one of those unless it's an 8" apo refractor. Good luck with the name. I need to find one for my scope. Joe, if you had to equate the amount of detail shown on Jupiter by the SCT to a refractor, what size refractor would you say most closely matches it? My guess would be 4-5". Someday I will set my SCT up beside my 92mm refractor and see how that works out. Nice report. But for a better comparison, install TEMPest fans on the EdgeHD 8", use a binoviewer and wait for a night of better seeing. I'm sure, though, that my 10" f/5 Dob would show more detail on Jupiter than either scope. Edited by Sarkikos, 07 June 2015 - 11:09 AM. I've had my 8" EdgeHD up against various sized Apo's and I'd second this! (but closer to 5" I think). Mike this would only be true IMO If your Dob has active cooling before and during viewing sessions. A few weeks ago when the temp suddenly dropped, A C11 and 10" ACF suddenly started to show softer Images whereas the EdgeHD stayed sharp. A Dob is much better at this than an SCT but a 10" mirror is still going to suffer a similar fate during early morning temp drops. I know you asked Joe, but I have owned 4", 110mm, and 5" Apo, 6 Apo, and 8" SCT (relevant to this conversation.. I have owned far more scopes than this). I think it is amazing how much detail you can see in a good 5" scope, but I have to say that I don't think I have ever seen more in a 5" Apo than I did in my EdgeHD 8", and the added brightness of the larger aperture just seems to make the lowest contrast detail hang on longer as you push up the magnifaction. I fell like the 5" Apo tops out at around 200x to 225x for me. Past this and my eyes just can't process any new detail. The image gets bigger, but the dimming simply makes the image more grainy. I think the 5" Apo and the EdgeHD 8" give very similar amounts of planetary detail, but I do think the color saturation on Jupiter and Saturn's banding is better in the EdgeHD 8". People dismiss the advantage aperture provides in stimulation the cones in the eye, but it is the cones that see color, and the more cones that fire, the more color the observer sees. Cones are fired by image brightness. An 8" scope fires a lot more cones for a given magnification. If you made me pick one for planetary observing, it would be an EdgeHD 8" simply because of the much brighter image, but neither of these would be my first choice for planetary observing. The 5 Apo will match it though when powers are under 175x. Great information everyone. Thanks for the insight. Yes, I have active cooling for my 10" Dob. For that scope, a fan in a baffle below the primary works fine. I have an EdgeHD 8", a SW120ED and a 10" solid tube Dob, and I know how Jupiter looks in all three. No 7" APO in the stable, but aperture does count for something. Some of my best views of Jupiter have been through the 10" Dob during early morning. All of my best views of Jupiter have been through the 10"! Edited by Sarkikos, 07 June 2015 - 09:44 PM. Fans are cheap and in common use on big dobs these days. For killer planetary views, there are a lot better choices than an EdgeHD 8" (or a 5" Apo) and the addition of a fan (my scope came with one) is a pretty trivial and inexpensive solution to the cooling problem. I would say the view of Jupiter in my 12" dob was twice as good as in an EdgeHD 8" or 5" Apo. Yes, adding a fan to a Dob is a trivial DIY project. A good system can be constructed with a fan, small portable battery, black foam core, outdoor sealant and Velcro. Set the fan in a baffle cut from the black foam core and suspend the baffle from the bottom edge of the OTA with four strips of Velcro. This setup will cool the primary efficiently, block glare, and inhibit induction of vibrations. It's also easily removed for collimation and cleaning of the optics. I've experimented with a fan blowing in and out. (Blowing in worked better over the course of a night.) Next I might try three small fans in the baffle. 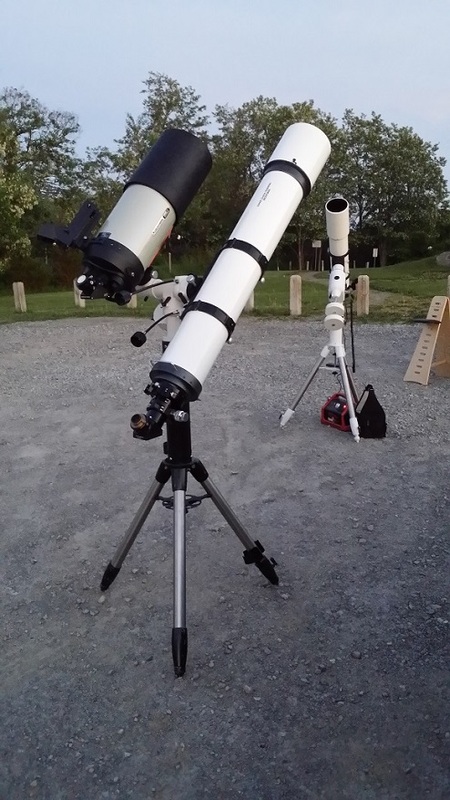 A 10" to 14" Dob that has decent optics and is thermally controlled and closely collimated will surpass a smaller APO when observing planet/lunar. I might be guilty of a bit of understatement here. I like my EdgeHD 8" for planet/lunar because I can take it out in one trip and it has tracking. The 4.7" APO takes two trips and does not have tracking. The 10" will show brighter, more colorful and more finely detailed planet/lunar images than either of them. Edited by Sarkikos, 08 June 2015 - 08:13 AM. Ahhh...if only adding a small fan would do the trick all the time. While I have no doubt in your environment this is all that is needed, for the temp and humidity conditions where I live in Virginia, having the fan running on my 10" Dob does zilch for thermal management. Even in summer time conditions where the temp delta between house and yard is but a few degrees, only thing that works is placing an oscillating house fan on high and pointing it down the tube of the scope for a good while, then I can get a good hour of observing in with relatively little tube thermal jitters. In the winter when the deltas will be 20-50 degrees, forget it as the 10" Newt becomes a DSO-only machine. I have a Celestron 10NGT OTA on a Dob mount. It should be very similar to your XT10. The conditions in Maryland are probably similar to those in Virginia. Here one simple fan in a baffle below the primary is sufficient to steady the images for very good planet/lunar observation. Takes about an hour, sometimes less. I let the fan run all night. On nights of good seeing I can observe Jupiter or another bright planet for hours. But here nights of good seeing are mostly between Memorial Day and Thanksgiving. Forget about Winter and Spring. I know bad seeing is the problem because I can see the stars twinkling like lights on a Christmas tree. Thermal deltas are a secondary concern if the seeing isn't worth a trip out for a look at the planets. Winter is for deep sky ... usually. Edited by Sarkikos, 08 June 2015 - 10:21 AM. Boundary layer fans work in two minutes. Most people don't want to take the effort to build them, but there is no reason that a large Newt has to sit around all night to cool off. Edited by Eddgie, 08 June 2015 - 12:10 PM. Edited by HowardK, 08 June 2015 - 03:50 PM. Boundary layer fans are easier to implement in large truss Dobs due to the open structure. Not so easy in a solid-tube scope, despite the article. Looks like the one in the article is a sonotube. Heck, if I had one of them, I'd be carving all kinds of holes in it. But how many amateurs have a sonotube nowadays? Steel tubes are de rigueur ... if there is a tube. If you're lucky - or skillful - you can get decent results with just a fan below the primary. Edited by Sarkikos, 08 June 2015 - 03:58 PM.